Anambra State stood still on Friday as Alex Ekwueme, Nigeria’s former Vice President was laid to rest in Oko, his home town. The burial had in attendance the Vice President, Prof. Yemi Osinbajo, as well as Goodluck Jonathan, former President of Nigeria. Top government officials, close friends and family members gathered to pay their lasts respect to the 85-year-old elder statesmen who died in November 2017. 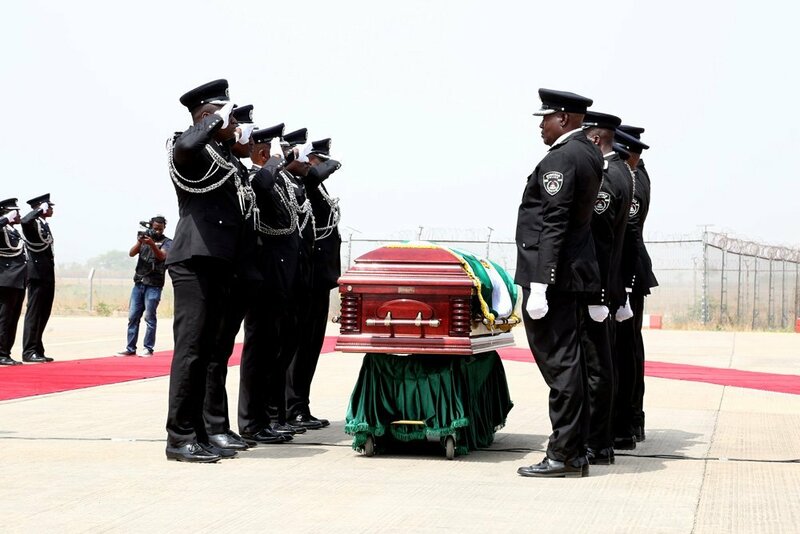 Some of those present to witness the final moments were Vice President Yemi Osinbajo and former President Goodluck Jonathan and his wife, Patience. Anambra State Governor, Willie Obiano, his colleague, Rochas Okorocha, Governor of Imo State, as well as Akinwunmi Ambode, Okezie Ikpeazu, Ifeanyi Okowa of Lagos, Abia and Delta State respectively, were also in attendance. Osinbajo, in his tribute to the former Vice President, described him as a true Nigerian icon, worthy of celebrating. He said Ekwueme was being immortalised for his selfless service, integrity and contributions to national development.